Ford’s recently unveiled Atlas, the auto giant’s re-imagining of its classic F-150 pickup, is getting a lot of attention these days. Eco-conscious consumers as well as the F-150’s traditional market have been at attention since Ford surprised attendees at the 2013 Detroit Auto Show with a prototype that promised exciting new things to come for the company’s mainstay work vehicle. If first looks are anything to go by, the 2015 F-150 will not be a disappointment. A host of new technologies, features and design tweaks blend the new with the best of the old to create a truck that is as familiar as an old pair of jeans, but without the malfunctioning zipper and the bind at the crotch. 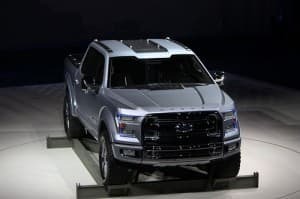 The Atlas boasts a smaller engine, but Ford’s engineers are confident the 2.7-liter turbocharged EcoBoost V-6 under the hood of the Atlas is more than enough to power the slimmed-down truck without reducing towing ability. If you were expecting to go with the 3.7-liter engine for your next truck purchase, Ford is offering a 3.5-liter non-turbo V-6 in its place. You can still opt for the 5.0-liter V-8. When the truck isn’t in four-wheel drive or in towing mode, it employs auto stop-start technology to save fuel and reduce emissions. Ford’s proprietary Active Grille Shutters can increase the vehicle’s aerodynamic performance by blocking air flow through the engine bay as needed. The 2015 Ford F-150 is still recognizable as a F-150, but it features some up-to-date styling, including a larger grille with chunkier bars and an extra-large blue Ford emblem. Wrap-around headlights with cutouts on the inside edge add to the updated look. Inside, Ford sticks with its tried-and-true work-truck design, including controls that don’t require you to take your gloves off in order to use them. Slightly redesigned air vents and an infotainment system with a touchscreen remind you that this isn’t quite your granddad’s truck, and such high-tech features as Sync and the new MyFord Touch prove that it isn’t your dad’s either. Like other 2015 Ford offerings, Atlas has inflatable seatbelts for backseat passengers and a system to automatically brake as necessary if you take a turn too sharply. Other safety features include technology to prevent accidental lane departure and overcome blind spots as well as an adaptive cruise control system. The Atlas features plenty of cool toys, including a key fob-operated tailgate, a disappearing tailgate step, loading ramps, two power outlets in the bed and a camera system that provides a 360 degree view and backup coverage that offers hitching assistance. You can expect all the choices and packages Ford has offered in the past, such as the F-150’s various trim packages, off-road packages, cab types and so on. The F-Series has ruled the road for nearly 4 decades, outselling its competitors year after year. Judging by what Ford has revealed of the Atlas so far, that record will continue to stand.